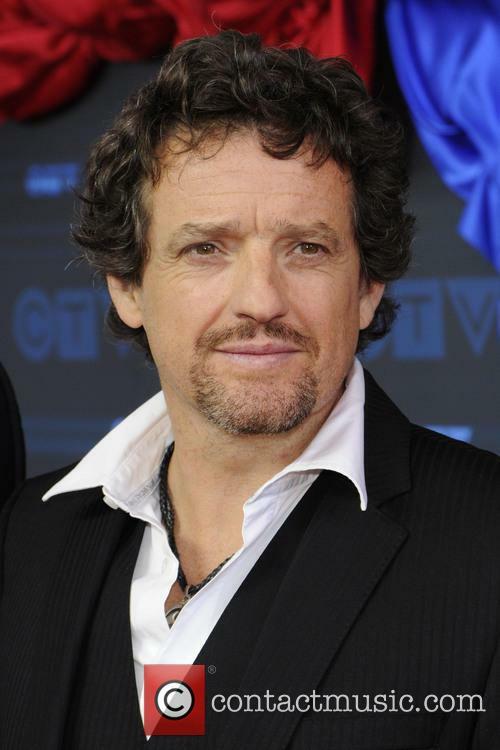 And once again the 20th of the month has rolled around and we have another big party here at Ferreira Fest where we celebrate the acting career of Louis Ferreira (Justin Louis). This month we have several questions answered, an exclusive interview with Breaking Bad location photographer Jeff Cathrow, Leo Awards news and CTV UpFront photos, tons of Friends updates, our Reading Series and much more! Help yourself to a pineapple drink of your choice at our open bar and come on in - the air conditioning is on! Did you know Ferreira Fest is on Twitter? We're inching towards 100 followers. If you're on Twitter please sign up to stay informed on all the current news about Louis and his friends! You can also read our feed right here. The recently held 14th annual Women's Golf Classic raised $260,000! The 5th Annual Joe Carter Golf Classic will be held on June 25 & 26, 2014. This annual charity event golf tournament will involve over 40 top name celebrities including stars from the world of sports and entertainment. Proceeds from the event will benefit The Children's Aid Foundation. Not a golf player? Couldn't hit a golf ball with the broad side of a barn? No worries. You can help support the charity by donating directly via our special donations page. Click on the banner below to get started. Remember that we'll send you a small Louis-related gift for your contribution, and that your donation is tax-deductible where applicable. The renovations at the Good Neighbours Club are in full swing! Check out the action photos on GNC's Facebook Page as they document the exterior wall waterproofing. Unfortunately the outside yard is unusable during this time but everyone is looking forward to completing the repairs, and then the outdoor barbeques will be back! Follow Lauro on Twitter at @lauromonteiro! On his recent trip to the CTV UpFront event Louis stopped by at GNC, much to the delight of their staff and club members. Please do the same if you live in the area - there is always something to do! Don't own a backhoe so you can help with the construction? No problem! Click on the banner below to give homeless older men in Toronto a safe place during the day. And of course you will also receive a small Louis-related gift as a personal thank you, and your contribution is tax-deductible (please be sure to check with your tax preparer)! Louis won the 2014 Leo Award for Best Lead Performance by a Male in a Dramatic Series in 2014 for his work on the MOTIVE episode "Fallen Angel". Congratulations, Louis! Since Louis himself was unable to attend the event his on-screen partner and colleague Kristin Lehman accepted the award on his behalf. In honor of this well-deserved honor we have screencaps of that episode this month. Scroll down to view the collection. Director Andy Mikita won the award for Best Direction in a Dramatic Series for directing the MOTIVE episode "Fallen Angel", and Katherine Isabelle won Best Guest Performance by a Female in a Dramatic Series for her work as the scheming diner waitress Leanne on the MOTIVE episode "Pushover". Other Leo Award winners include our friend Jennifer Spence who won the award for Best Supporting Performance by a Female in a Motion Picture for her role in Down River! Congratulations, Jen! Her movie Down River won Best Motion Picture. Jennifer's husband Ben Ratner, writer and director of Down River, won Best Screenwriting for a Motion Picture. Gloria Tsui won Best Costume Design for a Motion Picture. Jen's current series Continuum won a combined 7 Leo Awards - see Jen's news section below. Check out the full list of nominees and winners at the Leo Awards website, and read more about the event at The Province. Shortly after Ferreira Fest 53 was published the renewal of the show for another season hit the news and Louis has confirmed that he will reprise his role as Detective Oscar Vega in Season 3 of the series. Read the official news release at Bell Media. Check the article on TVrage. And read more at Digital Journal. So far there is no news which other television channels will air Season 3. Please send a tweet to @ABCNetwork and tell them you want to watch Season 3! Not on Twitter? Go to the ABC Contact Page and select "ABC Programming Feedback". Then ask for Season 3 in the form that pops up. It's easy! Thanks so much! If you're watching MOTIVE elsewhere in the world, go to your Channel's contact page and let them know you want to watch Season 3! Meanwhile, the start of Season 2 a month ago produced a flurry of previews and news items. Check out the sizeable list below! Season 2 has also begun airing in the UK - check here for dates and times. Purchase Season 1 on DVD at Amazon.co.uk! You can watch MOTIVE on Amazon.com. Great Motive reviews for Season 2 episodes can be found at TVequals - the author obviously enjoys the show and the relationships between the characters, especially Oscar and Angie. "ABC’s second-season cop drama Motive at 10 PM climbed 25% week to week in the demo to tie CBS’ CSI repeat in the hour. For its third consecutive telecast, Motive improved its hour, year to year, in total viewers (31% – 4.7 million vs. 3.6 million)." The Huffington Post has published a thoughtful article about the prevalence of Canadian Shows on US TV. It's a great read and Louis gets a very nice review! The 2014 CTV UpFront event resulted in a plethora of great photos of the MOTIVE gang who was present to promote Season 3 of their show. Click on the images to view the originals. Thanks to our researcher Agi for finding these pictures! Thanks to Getty Images we now have a good collection of royalty-free professional images of Louis during public appearances and stills of MOTIVE. In fact, all the Getty Images have now been placed on their very own web pages here at The Friends of Louis Ferreira, sorted into two sections. Please be aware that those pages take a while to load since every single image links back to Getty. Thanks for your patience - it will be well worth your wait! To give you a little taste of what's on there, here are four images from a recent photo shoot during the CTV UpFront weekend. Many thanks to our researcher Agi for working out the coding for all those images! Through The Pane is now on Twitter! Follow it at @ThroughthePane! Through the Pane update!! We are now submitted to Venice Film Festival, New York Film Festival, Toronto International Film Festival, Vancouver International Film Festival, Best Shorts LA Competition, Raindance International Film Festival, Seattle Shorts, Montreal World Film Festival, Hollywood Reel Independent Film Festival and Heartland Film Festival... and now... SUNDANCE!!! Congratulations, Team, and best wishes for the festival circuit! I had a chance to catch a private preview of the movie, and it is absolutely beautiful! Since I've been sworn to secrecy you won't find any spoilers here, but hopefully you will be able to watch it soon as well. For personal thoughts of Louis, who plays Lewis in the movie, check out Ferreira Fest 48. Visit Jeff Cathrow's page here at The Friends of Louis Ferreira. Louis played the character of Declan in three episodes of the critically acclaimed series Breaking Bad. We have featured the artwork of Jeff Cathrow's location photography of the show before (see Ferreira Fest 47). Louis loves Jeff's photographs and proudly displays the "Declan Series" in his home. Jeff has kindly agreed to an in-depth exclusive interview about his work here. FF – Hi Jeff, this is Bea from Ferreira Fest and because of legal obligations I have to ask you if it’s okay to record this interview. JC – Yes it is. FF – Okay, great, fantastic. So, first question: tell us a little bit about yourself. Who is Jeff Cathrow? What do you do for a living? And tell us about The Night Shift. JC – Basically I’m a photographer. I have been since, oh, I started out as a kid actually. And I’ve also been a big film buff and watch a lot of things on Netflix now that it is around, and I happened to tune in to the very first episode of Breaking Bad back in 2008. I guess I’d seen a couple of previews on AMC and it looked really interesting and even at that time I didn’t really watch much television but it kind of intrigued me. I thought this might be worth checking out. And so sure enough I did. And I was definitely hooked from the very first episode. I thought that this is great, this is just fantastic. I had lived in New Mexico prior to that. So, when I saw Breaking Bad come up and I recognized the scenery and saw Albuquerque was involved I thought, oh, wow, I gotta see this, this is going to be really fun, you know. I hadn’t been in Albuquerque for many years. And back in the 90’s and early 2000 decade I was doing a lot of photography, or selling a lot of my work actually, to Nordstrom and other big corporate clients. And so I was kind of able to live pretty much anywhere I could set up a dark room and make my prints. So, we moved to Hawaii and I continued to do that, oh gosh, until about 2010 or so. And because of the economy and style changes and so on, Nordstrom stopped buying my work and they kind of switched over, instead of original prints they bought, started buying posters. You know, ready-made framed art to put in their store hallways and walls, dressing rooms and so on. My wife had kind of really gotten burned out on Hawaii and in 2011 we took our vacation to Albuquerque. So we had a car and we drove around for a couple of weeks and saw the sights. And we were particularly interested in seeing where they filmed Breaking Bad. By then both of us were huge fans. JC – And so we spotted the car wash, we just happened to be driving along one day and, oh, that’s the car wash they used. So one thing led to another and I started seeking out the locations that they used, while we were there, trying to get as many shots as I could. JC – You remember that episode. So, we got that, and we went down to what was Los Pollos Hermanos in the show, which is actually Twisters, a sort of a drive-in fast food joint and took pictures of the Los Pollos Hermanos mural that’s painted there inside. Anyway, we had a great time. And we really loved being back in Albuquerque so we started making plans to move there. And sure enough the following year, 2012, come April, mid-April, we actually had packed up our belongings and vehicles, and cats, three cats, and we moved to Albuquerque. Once we were there, after getting a bit settled, I started going out more seriously with my camera and tracking down many, many other Breaking Bad sites to photograph with the idea of putting them into greeting cards. And that worked out pretty well. I bought myself a big Epson inkjet, a professional inkjet printer, which is what I make them on. I tried them out and they printed out very nicely, so it just kind of snow-balled into a nice little operation. FF – I remember we were corresponding and you said at some point that you’d actually gotten involved in the filming of the show? Can you talk a little bit about that? JC – Yes, I, you know, technically I can say that I worked on Breaking Bad. That was a huge personal thrill for me because I was such a big fan. And it all happened, literally, 10 days before we left Albuquerque. I had previously signed up with White Turtle Casting Agency, there, which is the same casting agency that did Breaking Bad. And they came up with the role, a possible role, they were looking for doctors, real doctors and nurses for this upcoming show which, of course, turned out to be The Night Shift. At the time it was titled "After Hours". That’s what they originally called it. And I thought well, heck, I got this white lab coat that I bought when we lived in San Francisco, so I had this outfit and I thought, they’re the same casting agency that does Breaking Bad, it’s worth a shot just to get my foot in the door and get me noticed if I sign up for this After Hours role. JC – You know, just a background actor. And so I dressed up as a doctor and went out and set up my tripod, and I just did a whole bunch of self-portraits, different poses and expressions, in my lab coat and stethoscope and clipboard and I even had some black and white slides that were in this little panel that you held up to the light and it kind of looked like I was looking at x-rays. JC – So I got that out and I sent them a nice group of shots that I ended up with. And sure enough I got a call, oh, a week or so later: we need a doctor tomorrow, are you available? And I said, sure, yeah, I’d be happy to do that. The only two scenes I’d been in so far are the ones they shot there at Gibson outside the hospital, which is partially occupied. Part of it is a working hospital, and then the other part is under renovation. And I guess they’re doing the whole thing, but they used that part, the unoccupied part, for a lot of episodes in Breaking Bad as well. Just as a side note. I later went back and photographed later because they had used it in Breaking Bad, so…. FF – So, when you got the part as the… that was for Breaking Bad? The background extra? You played a doctor on Breaking Bad as well? Or…. JC – No, I’m sorry. The first part I got, yeah, thank you for getting me back on track here, Bea. I landed the part as a day shift doctor for The Night Shift. So, they filmed us outside the hospital late in the afternoon or early in the morning. We were either going to work or leaving work, and then the night shift was coming on, that sort of thing. And they did probably 7 or 8 different scenes with me. I’ve only seen two of them so far and so I’m hoping that I’ll still be in more episodes of The Night Shift, coming up. Even if it’s just a second or two here or there it’s fine. JC – It was so much fun. Anyway, I’ll fast forward now to actually before that, in January of 2012, just shortly before we left Albuquerque, to move to here, I got a call from Dock at White Turtle and it was a rush call. They had a cancellation, somebody couldn’t make it and so they needed somebody to fill in for the scene at Garduno’s, the Mexican restaurant there. So I was there on the set. I got there, it was an afternoon shoot, and I was in the big restaurant scene with Hank and Marie and Walt and Skyler in the episode called Confessions. FF – Right. I remember. JC – And I was sitting at the bar, way in the back, talking to this young lady who was supposedly celebrating her birthday. We were drinking margaritas and singing Happy Birthday and toasting her and everything. But the irony is that the whole time I was there the camera, I couldn’t see the cameras from where I was sitting. Of course, I wasn’t really looking too hard because I didn’t want to look at the camera. Especially when they were filming. JC – So I just took it for granted that the cameras would see me and I’d get some face time, hopefully, or at least be seen. But where I was sitting was completely blocked, either by other guests in the restaurant or this post kind over in the corner where Marie was sitting. JC – And so I’ve watched that episode probably twenty times and looked so closely but I’ve never once seen myself. And I at first thought it had just been edited from the scene. But I later realized I think it just happened to be bad luck on where I was actually sitting. FF – Yeah, yeah, the angle. JC – Because I could not be seen at all, so technically I was on Breaking Bad, but only technically. JC – That was my one and only little official employment from Breaking Bad, but I was so involved with the show before then because I was going around shooting all the locations. JC – And I recognized the crew and everybody. It was really kind of a kick just to be there and actually be on the set. JC – On the other side of the camera. FF – Well, let’s talk a little bit about your actual photos because, you know, we’ve featured them on Ferreira Fest before. So people are familiar with your work. Can you tell us a little bit about what the process is? Of creating one of those vistas that you do as a photographer? I’m assuming it takes, it starts with the actual picture but what you actually put out on eBay and when you sell, is very different from just a normal photograph. If you can talk a little bit about the process from taking, like snapping a picture, to actually putting it out there as artwork. JC – Well, of course, once I find a location that was used, if the light is good, and you know most of the time it is, the light in New Mexico is just wonderful. You know, 99% of the time it’s a fantastic place to do outdoor photography anyway. I usually take quite a few shots unless it’s something that is really sort of transitory. I generally use my ultra-wide angle lens. I like wide angles a lot. I like to get close to my subject, wherever I can. Although some of these subjects, particularly Declan’s cards, are more or less sort of sweeping vistas of landscapes and so on. JC – But there again, the wide angle is great for that. And I love the view of the Manzanos, the mountains to the east of Albuquerque and slightly to the south. And those mountains are featured prominently in a lot of the scenes that took place that are supposedly in Mexico, and Declan was out there and dealing with Walt and Mike and everybody. So on my trip to Albuquerque last summer, while I was there a whole month I would go out whenever I wasn’t on the set of The Night Shift. I was out seeking out these other locations that I hadn’t visited yet. Anyway, I get the shot and then when I get back home I upload all the photos onto my computer. And then I open them up, say like I took a shot like Declan’s mesa which is one of my personal favorites of my whole series… that was shot out in Los Padillas which is kind of a little suburb south/ southwest of Albuquerque. And that mesa is just sort of a low mesa that overlooks I-25 on one side and then Los Padillas road on the other. And it’s kind of remote. It’s a couple of miles out. And there’s that dirt road where those trees are that you see in my photograph, that goes up to that mesa. And I was out there in January of 2012, there again, just before we left, moved from Albuquerque, just to watch them film. I was following everywhere they were filming, as much as I could. When I knew they were going to be some place, I was out there as much as possible trying to get shots. And I could see them, you know, the security people, up there on top of the mesa just standing there like guards, guarding a fortress up on the mesa. And I knew they were doing something probably up in that industrial shed that they had up there. But little did I know it was going to be, supposedly, Declan’s underground drug bunker/ school bus. But I was up there and I was out for a couple of hours and I just took shots from down below and didn’t really get up to the location until last summer when I went out there in August and photographed Declan’s gate and Declan’s mesa and the site of his massacre which I believe they call Declan’s ABQ compound. JC – And, I didn’t know at the time, I just wandered up there, the gate was open, but apparently they don’t really take well to trespassers up there. Whoever has that junkyard, or whatever it is, just like some metal sheds, maybe somebody’s home, and a lot of old dilapidated vehicles and machinery, and so on. But I didn’t see anybody, except for a fellow on some kind of plowing implement and I just stood behind this big old rusty tank and waited until he passed, with his dog too, and before I took any more shots… but I later found out they really don’t like trespassers and I could have gotten in big trouble if he had seen me. But anyway, I managed to get some good shots of where the bus was supposedly buried and the action took place. And then I just made my way back down and got out of there. And when I got back home I downloaded them. And then once I downloaded the photos on my computer, I opened them up in Photoshop, which I’m not extremely well versed in. I taught myself how to edit and manipulate photos on my own. As I’ve done most everything in photography, I’m pretty much self-taught. That’s the way I tend to operate. And I will often enhance the color and shift the color and saturate the colors. And, maybe in one section of the photo I’ll change the color of the sky, and another I’ll change some objects. I just kind of go through and put my little artistic twist on things the way I kind of think that best evokes the mood that I’m trying to recreate when I take the shot. JC – And I generally, not always, but I generally will frame them in a black border, if somebody’s been killed at that scene, like Declan and his crew got massacred. So of course I always do Declan’s mesa with the black border and I think probably just about all of his. FF – Yeah. The whole series had the black border, yeah. JC – And other times I might put a Breaking Bad green, that kind of forest green that they had the logo set against. I’ll put that on sometimes. Or maybe no border at all. It’s just a minor detail that I will add or not add, depending, from time to time. But it’s mostly a lot of manipulation of colors and contrast and texture. I’m a big fan of texture and I’ve done a lot of color photography as well as black and white over the years and most of my color photography really gravitates towards the abstract with the focus on texture. JC – And so I’m always looking for really interesting texture in all my shots. The fact that I loved the show was almost immaterial. The subject, the sets and the locations they used were just right for the kind of shots that I like to take. It really was a very happy coincidence. FF – So, Jeff, one final question that I have for you that people will be interested in. Where can we purchase copies of your work? Is it mostly on eBay that you sell? Or is there another place that I can send them to? JC – Yeah, it’s really just eBay. JC – I haven’t tried to venture beyond there. FF – So e-bay is our best bet. Just go to eBay and to your page. JC – It is. Because I almost always have something on eBay. JC – And I just re-listed all the other cards that I had before and I don’t have all those in stock, but I’m going to get my printer squared away here very soon. So I’ll be able to print up anything that anybody needs, or wants, that I don’t have in stock. You know, now that I’ve got the series, I’ve had suggestions from different customers - am I ever going to do a book of my Breaking Bad locations? FF – That would be fantastic. JC – That’s an excellent idea, I just tend to procrastinate so many things and I really need to get on the ball and get something like that going. JC – And that may be a possibility. It’s not a bad idea and I might even be able to do a prototype on my printer here. FF – Well, thank you so much for your time, again, Jeff. This is really terrific and a little unexpected that I would get to talk to you today and all that. So this is really great and I really do appreciate you taking the time. I’ll talk to you soon. JC – You’re welcome. Bye-bye. Many thanks to Casey for the transcript! Please visit Jeff Cathrow's page here at The Friends of Louis Ferreira! Now you know where to go when looking for a gift for the Breaking Bad fan in your life - purchase some of Jeff's artwork on eBay (scroll down)! In honor of Jeff Cathrow's interview above, Louis shares some thoughts about using a backstory to create Declan's character. FF – Did you establish a backstory for Declan for yourself? LF – Always. You always do. I think that’s part of the process. We all have backstories. I think it’s just something you just naturally do when you act, when you create any character. It always benefits you. So, yeah, absolutely I did. FF – I remember reading the original casting description, I guess, when they were looking for Declan, when it was just posted out there. And, it was really interesting because it said that, you know, he doesn’t carry a gun, it’s not his style. And he’s wary but relaxed and very centered. And I know we’ve talked about the character a lot and how totally you hit the nail on the head with that, because that’s exactly what I saw, in the character on the screen. LF – He just stood there. I literally, they literally had me being spiritual, I mean I barely moved and that was part of it, I think. I think, I thought my first thought was like some version of a spiritual gangster. Like that, but in the sense of someone who was grounded in who he was, spiritual being, whatever it is I put there. But you know what people call spiritual which is a sense of being grounded, connected to something bigger than yourself. I definitely saw that in Declan and tried to embody that. It’s interesting to watch, people come from a place where you don’t quite know what it is. I think it’s always interesting when you watch certain actors and you’re not quite sure where they’re coming from but that’s what makes it interesting. And I think that’s where the backstory, where the actor does the work himself, can translate. When you see really good performances like there’s always a quality of like, man, he’s always either looks like there’s something going on, or something he’s thinking. And I think some actors do that really exceptionally well. And those are certainly the actors that I personally have admired throughout my life and career, and certainly the people that I look to as far as the kind of performances that I enjoy watching. FF – I always thought it was interesting that there’s always a moment where he seems amused. Sort of quietly amused about what’s happening. LF – A lot of times when you play villains or you know typical bad guys there’s a lot of ego involved, a lot of times there’s a lot of fear out of insecurity because of the ego so you over compensate. And these guys are usually larger than life. There’s something interesting about trying to play someone who is in fact ego-less, in a way from the perspective of there was the lack… he was fearless. He had made peace with… if his time was going to come, it was going to come in its own manner and so, he didn’t operate with that kind of fear, he just didn’t think of it. And I thought that that was kind of an interesting thing to have the stakes be so high but yet there’s a casualness, obviously in how it’s approached because to him, it’s like, everything in perspective so yes, we can say, yes, I’ve made a fifty million dollar deal and I’m going to have a taco for lunch. Absolutely the same impact in the sense, it’s how you view it. LF – And actually that comes from a very spiritual place to begin with. That kind of mentality, to think, for me to try to apply. But yeah, that’s exactly right. Definitely backstory is always a plus and I think it’s absolutely, I think it’s necessary. The more backstory you do… it’s like the more homework you do, the more levels and the richer you are, you’re going to get a better performance by doing… it’s like, it’s just the way it is. Work equals productivity equals results. Again it’s you, it’s an aspect of you, it’s just you in those situations, so, that’s what’s kind of neat about acting. More of Louis' comments about his role as Declan on Breaking Bad can be found in Ferreira Fest 45, Ferreira Fest 46, Ferreira Fest 47 and Ferreira Fest 48. Q: What sports do you like to follow? LF – I’m certainly not a huge sports watcher anymore. I used to be much more into it. I’ll tend to follow, you know, I’ll tend to get into sports a little bit more for… into the playoffs. I’m a hockey fan. With my two teams being Toronto and Vancouver. I’m a basketball fan. Huge basketball fan. I’ve always been a Lakers fan. Going back to the seventies. So, Lakers are my basketball team. And I like soccer. With Portugal and Brazil. LF – And I’m a huge fan of the Olympics. I love my Olympics. I love to watch young athletes just, that kind of commitment and drive and, it’s inspiring to all. And the work they put in for something. It’s kind of like auditioning, but it’s even more intense because they’re literally trained, and then every four years they’re given like sometimes seconds to prove themselves. To try to win a medal. I mean it’s just like, it’s insanity. It’s like, as an actor you do the thing, you do all this work and then you spend three, four, five, six, seven, eight days on a project, go in for five minutes and you don’t know. And you’re, it’s at the whim of what happens in that room, doesn’t mean you’re not great or good or could do a better job. It’s just what happens in that, what happens at that time that you got. That’s the art of auditioning. Which to me is almost, to me, is like, kind of what athletes do. If you think about it. Like a ski jump. And you see the element of luck as well. Any one of those athletes can technically win a gold medal. LF – In that moment of, like, you know, anything, that’s kind of one of those incredible things about just how it works. FF – So, the element of luck and just not knowing what other powers are in place. FF – And how other people are doing for that matter. Because other people’s performance influences what your outcome will be and you have absolutely no control over that. FF – Let’s see, I also have a question from Sabrina, she’s thirteen. And she’s from Evansville, Indiana. "What do you like to do on the weekends when you’re not filming?" LF – I like to play—everything. I like to swim, I like to bike, I like to play ping pong, I like to barbecue, I like to play board games, I like to take my dogs for a walk, I like to read, I like to write, I like to do anything and everything that’s expressive and fun. Thanks for your question, Sabrina! Louis' dog Giancarlo knows how to beat the summer heat! Thanks for the great photo, Louis! Billie is now officially Oscar Vega's dog as well. Thanks for sharing, MotiveTV! On my recent trip to Los Angeles I had breakfast with Louis and his friends. From left to right: David, Bea, Pauline, Justin, Louis and Chance. Pauline and Justin were breezing through - from Australia on their way to Vancouver, with a brief stopover in LA. Perfect timing! Louis tweeted on Fathers' Day - such a proud dad! If you haven't visited Louis' favorite website lately it's time to drop in at The Daily Love and see what inspires him on a daily basis. And coffee! Made even better when served with a helping of MOTIVE! Another one of those great MOTIVE quotes! Thanks @MotiveABC! Thanks to the following people for tweeting! Click on the links below or on the tweets to follow them on Twitter. This month's screencaps are from the MOTIVE Season 1 episode "Fallen Angel" in honor of Louis' Leo Award which he received for his work on this episode. When Munchie meets a dog on the beach, they sniff each other for a while. Sometimes they make friends and play for a long time, and sometimes they just keep going on their own paths. I've met a lot of people who, after failed marriages, admitted: "I wish I'd sniffed him a little more before I went home with him." Sometimes a few extra sniffs now can save a long time living with a really bad smell. Bradley's short film "Found" had its premiere at the SOHO International Film Festival in New York. Here are some pictures of Bradley, Caitlin and others at the event, plus the SOHO Film Festival poster featuring Bradley's movie! Click the thumbnails to go to the original posts. Watch the trailer for "Found" on the Stryke-Force Films website! As you may know Peter is a prolific voice actor, and one of his current projects is voicing Yoda in The Lego Star Wars series. Click on the screencap to go to the series website and watch! Note: it's very cute AND very funny!! Peter also posted the link on Twitter. Be sure to visit Peter's page right here! Rob's new series "Gang Related" is now in full swing. The first episode that Rob wrote, "Perros" (Dogs) has already aired. His next episode "La Luz Verde" will air later this summer. Here are some reviews - give the show a try and check it out! Please note that the series is intended for mature audiences only. I met up with Ingrid and Rob at LYFE Kitchen in Culver City a few weeks ago. We chatted over dinner and had a wonderful time together. Big smiles all around! See pictures of Jen at the 2014 Leo Awards on her page here at The Friends of Louis Ferreira. Here's a nice article with a photo on Straight.com. The Down River website now has a Screenings & Tickets page, so you always know where you can catch it on a big screen and where to purchase tickets! August 27th - Portland, Oregon's Northwest Film Center. Buy tickets here. On July 15th it becomes available on iTunes and Video On Demand. Down River also won Best World Showcase at the SOHO International Film Festival. Check out the Down River Facebook page for additional info. Here's a lovely article about Jen and her husband Ben at Vancouver's WE magazine. And finally: a totally new look for Jen Spence! Jen guest starred as Susan Lee in the 2012 episode "Webb Porter" in the series Alcatraz. Thanks to Alma for all the Friends updates! The DVD set for MOTIVE Season 1 will be released in stores in France at the end of the month. News about the season 3 renewal has also made it to France. At this time there is no word on whether it will be picked up for broadcast there. Check out our French Sister Site, edited by our staff member Anne! Rookie Blue reruns are on Universal Channel on weekdays. There are three episodes starting at 5:10 AM, and another one around 2 AM. They should get to season 4 episodes in about two weeks' time. Louis guest stars in episodes 1 and 5 as Detective Jacob Blackstone. Stargate Universe is on AXN Black, there are two episodes broadcast each day from Thursday to Sunday at different times. And finally, here is the promised scene from Chestnut - Hero of Central Park. Sadly there are no subtitles for this, but I hope you still have some fun with it. This is Louis' Hungarian voice! Thanks to Ildi for the news and the video excerpt! Lucas Talent Inc. proudly announces that Muse Artist Management and JR Talent Inc. are joining the Lucas Talent Inc. team to form a formidable agency staffed with fifteen top Canadian agents, managers and support staff. The new look of Lucas Talent Inc. officially rolls out on 7.7.14. The move makes for a big agency that will offer big service. We look forward to maximizing the opportunities for all our clients through the collaboration of our experienced agents from all departments. Louis Ferreira is represented by Lucas Talent Inc.
Congratulations to all the agents and staff! Ferreira Fest is pleased to have your business listed on our Contact Page! The Carmine Giovinazzo movie "DUKE" in which Louis plays the role of a security guard is now available for purchase at Amazon. Get your copy now while it's still there! As a Friend of Louis you know that, of course. But if you shop at Whole Foods or similar retailers you can get your MOTIVE kick in the nutritional supplement aisle: the Vega brand is just about everywhere you look! So while you cannot have THE Oscar Vega you can do something good for your body and stock up on Vega stuff! As of this publication we have had visitors from 59 countries and 264 different regions worldwide! Check out our Flag Counter on the Home Page. It is located in the sidebar on the left right underneath the tabs for all of our web pages. Click on the country/ flag list and revel in all sorts of interesting statistical data!